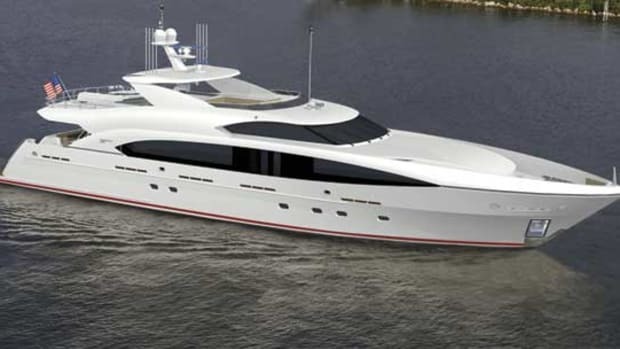 Trinity’s latest launch has an elegant interior and new hull form. 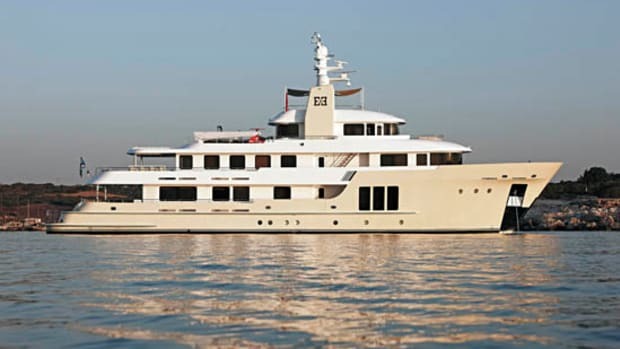 Mi Sueo was on her way to Boston from Fort Lauderdale when she stopped at Casey’s Marina in Newport, Rhode Island, home to other impressive yachts including the 125-foot Cheoy Lee Namoh and the 157-foot Christensen Nice N’ Easy (currently for sale, if you’re in the market). 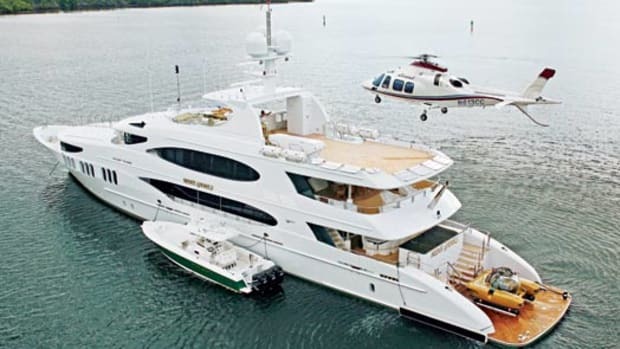 But at 190 feet she was considerably bigger than anything else in the marina and spanned the length of a pier that is often used to accommodate two yachts. But this is one yacht that is about more than just size. 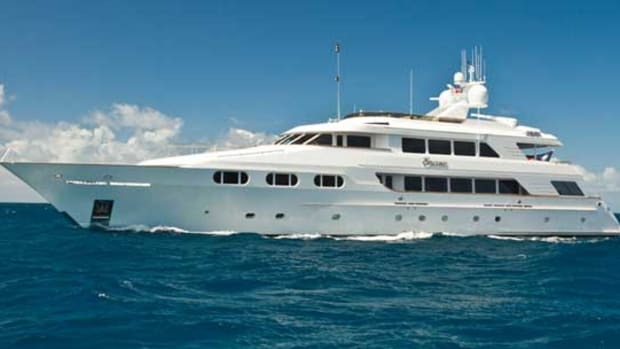 If you approach Mi Sueo from the bow, your first impression is that she’s classically elegant. 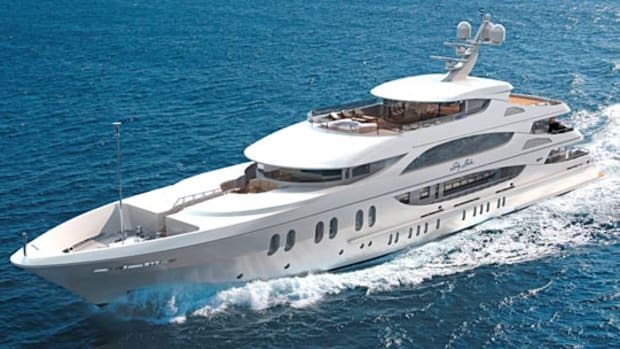 Her sleek lines are accented by pocket anchors, and as the lines flow aft they’re interrupted only by vertical oval windows that are big enough that you could almost stand in them. Mi Sueo’s helm station and dining area act as gathering places and extend full beam for maximum conviviality. 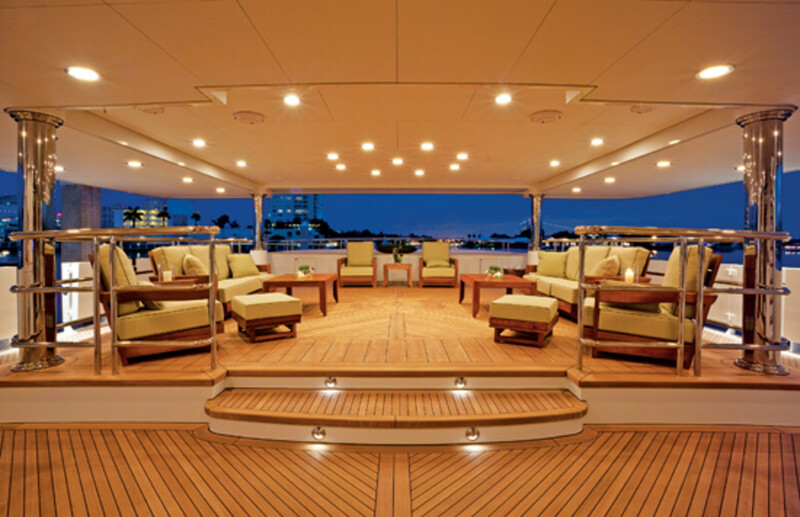 The aft deck is elevated to accommodate a garage. Mi Sueo’s owner purchased her halfway through construction, and of course provided a lot of input, including naming her after his thoroughbred racehorse. (Mi sueo is Spanish for “my dream.”) Another of his ideas was to store her tenders in a garage rather than on deck. Following the dictum of form following function, the aft guest seating area above this space has been raised to accommodate a crane beneath it. 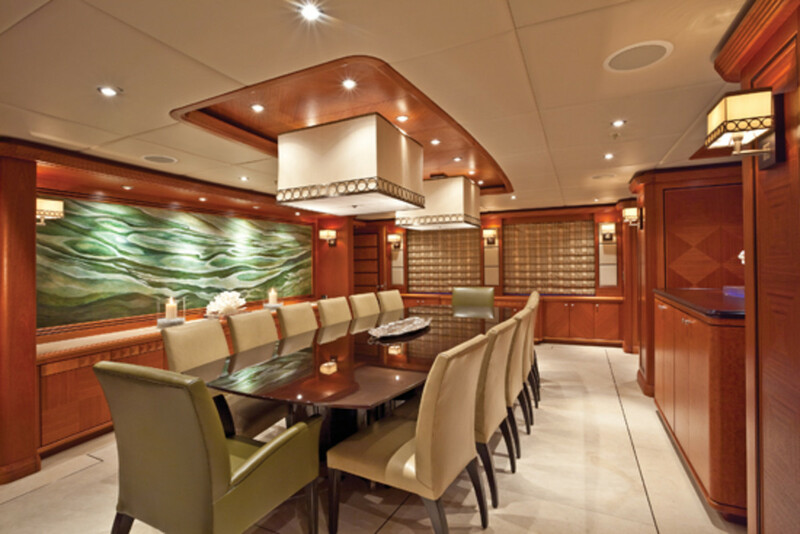 The additional elevation also allows guests a more expansive view over the yacht’s bulwarks. Railings define the spaces between guest lounging areas and crew walkways. The textures, colors, and materials were inspired by Burger’s Best N Show. Inside, there’s more fresh thinking. Enter the main saloon through the aft doors and into a foyer and you see what surely will be one of the centers of attraction onboard: the wine cellar. It holds 500 bottles—250 bottles of red to port and 250 bottles of white and champagne to starboard. Beneath are polished wormwood drawers capable of storing up to 400 double corona cigars. When preparing for a party in the saloon, this foyer can be hidden by a curtain until the dramatic unveiling. 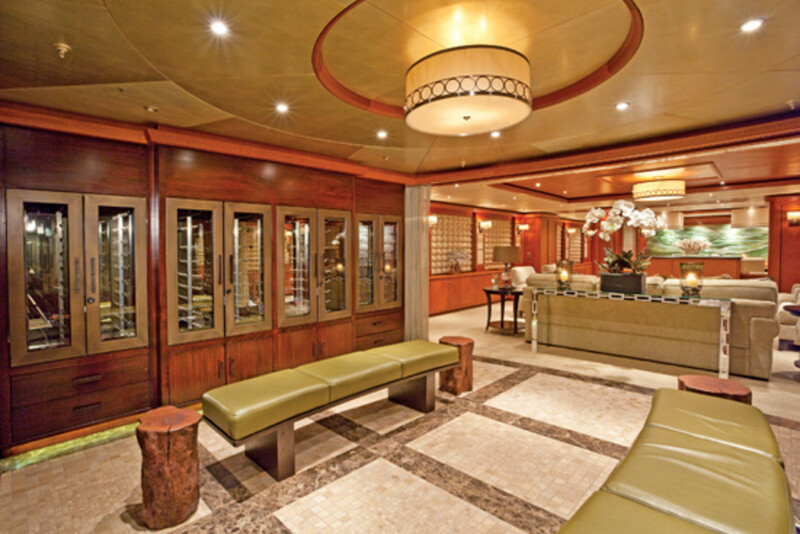 The wine-cellar foyer also serves a design function, introducing guests to the casual elegance that permeates this yacht. Patrick Knowles, Mi Sueo’s interior designer, says that he and the owners wanted “to make [the foyer] the absolute key statement when you walk in.” Helping to do just that are benches made from petrified tree trunks, which give an organic, earthy feel that perfectly matches the wine experience, he says. The saloon itself blends into a dining room with a table that can seat 14. 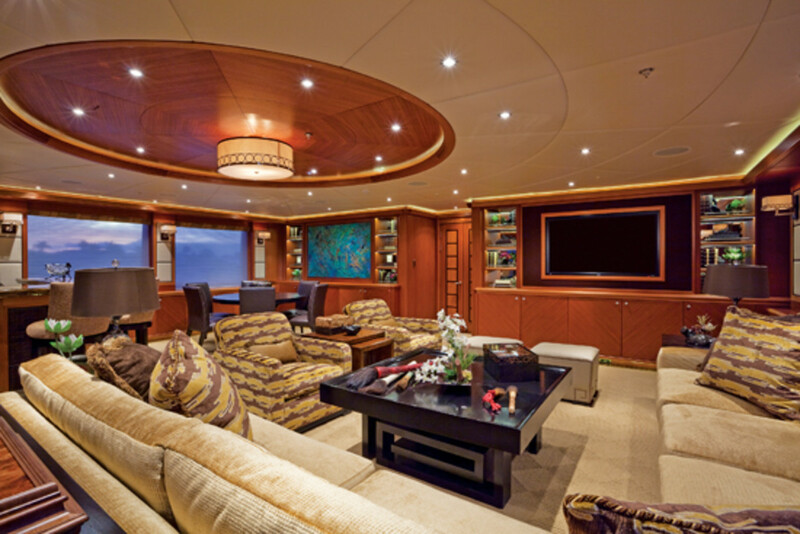 These two areas are divided by a low sideboard that houses a retractable and rotating TV, one of 13 onboard. 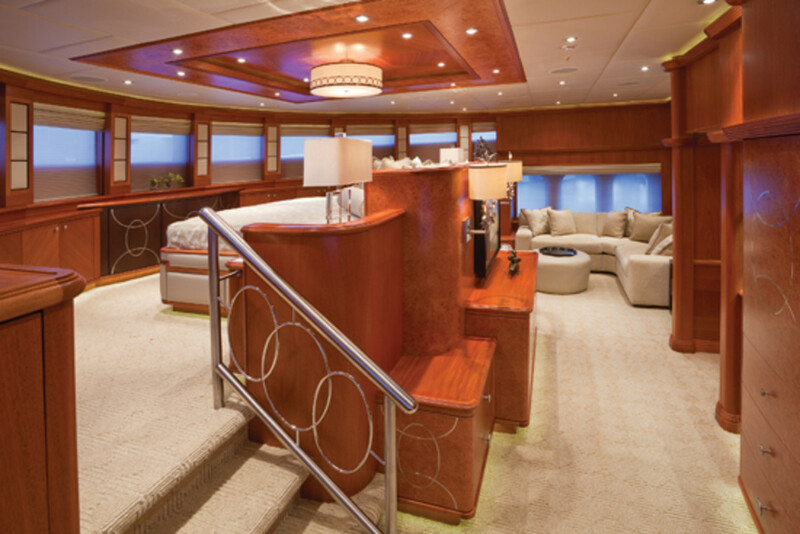 From here, a starboard hallway leads forward to the master suite, passing a side entrance and an elevator that leads to all decks; both are wide enough to accommodate wheelchairs. The main staircase, also here, extends from the guest level to the skylounge and is accented throughout by nickel circles inset into mahogany. 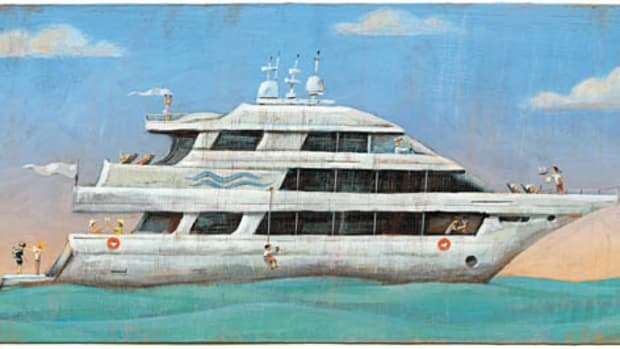 Knowles says this theme, which doesn’t have any personal significance to the owners, was designed to give the yacht a sense of identity. A day head, also off this hallway, is unusually bright since it features one of those person-size windows, this one made of one-way glass to ensure privacy. The master suite is actually comprised of five separate spaces: an office, walk-in closet, his-and-hers bathrooms, and bedroom. 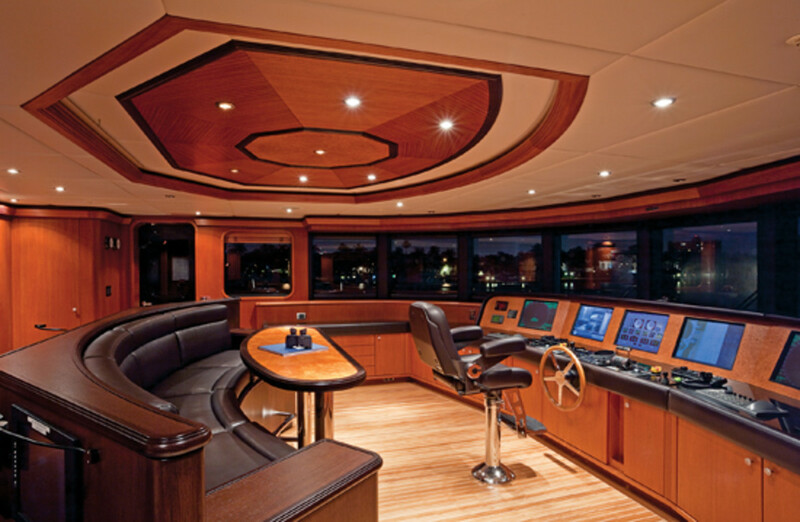 You pass the office first upon entering; its large desk faces a window, offering a view that is bound to make concentration difficult when the boat is at sea. Her bathroom features a luxurious whirlpool tub with yet more large windows from which to view the sea; his is more utilitarian but just as luxurious thanks to black marble countertops. The master bedroom is, of course, the pice de rsistance, with 180-degree views and vaulted ceilings. The bed is on an elevated portion of the floor, providing a view over the bow that is all ocean and a pretty convincing argument to stay in bed. 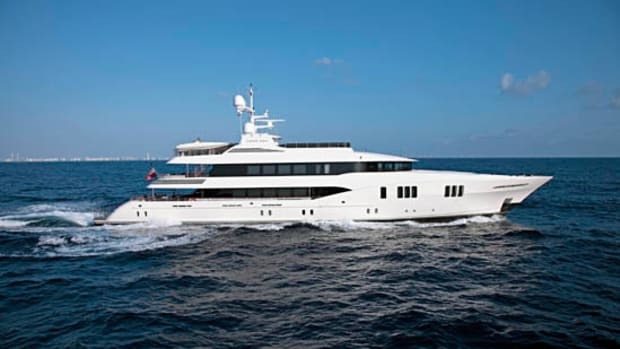 Many of the owner’s other ideas were designed to make the yacht more desirable for chartering. “[He’s] a young business guy who researched the charter market,” explains Smith, and it appears his research has paid off handsomely. 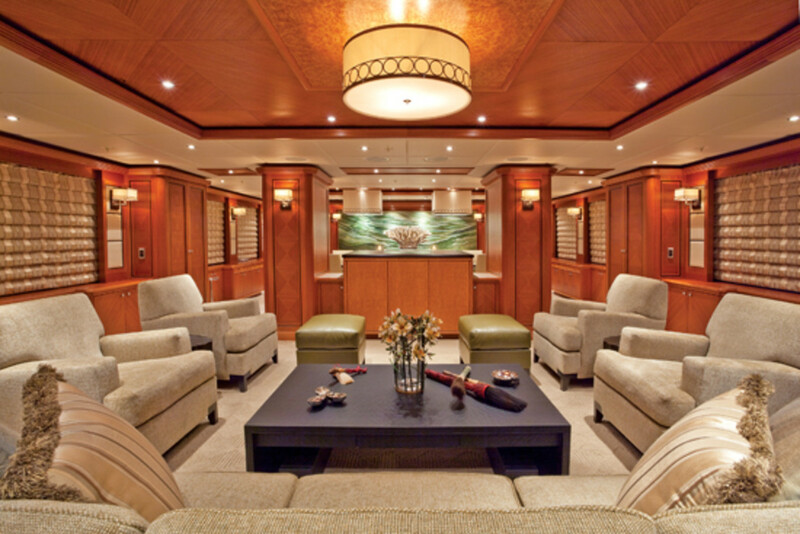 Five guest staterooms—including a full-beam VIP and a handicap-accessible suite—are on a separate lower deck, close to the crew quarters. Up top on the sundeck there’s a touch-and-go helicopter pad that Smith says was designed for occasional use such as picking up and dropping off guests, or in a worst-case scenario, medivac use. A beautiful teak desk hides the area’s utilitarian purpose; when not in use as a helipad, lounge chairs, exercise equipment, and jet skis can be arranged here. The radar arch conceals an electronics closet and another day head. A whirlpool tub and splash/wading pool are also located on the sundeck, the wading pool having been included for the owner’s daughter, says Knowles. 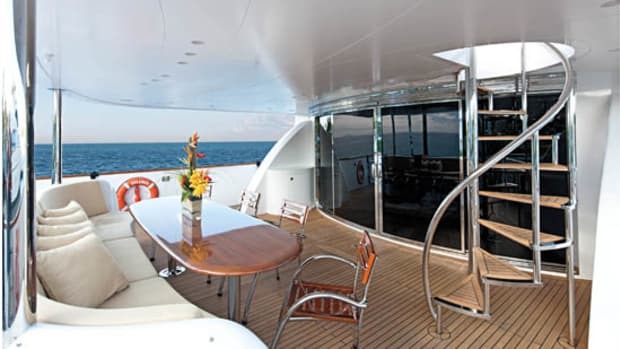 Just forward of the pools is a benchseat protected by a low windshield for some of the best views on the yacht, whether underway or at anchor. Much of Mi Sueo’s interior is Honduran mahogany, often in beautifully crafted parquet or chevron patterns on the cabinets and below the chair rail, and is based on the look of the 94-foot Burger Best N Show (also designed by Knowles) featuring shades of sage and celadon. “A calm and serene personality ultimately appealed to the owner,” Knowles says. “He wanted an environment that is warm and inviting but also contemporary.” The tones and colors change up top, however. “The palette of the skylounge is driven by the tiger’s eye.” Knowles explains, referring to the striking brown and gold semi-precious stone that’s in the bar countertop. Because usable tiger’s eye can only be found in small pieces, the counter is a jigsaw puzzle of pieces laid in resin. “It’s such an expensive stone, it needed to be where people can see it and appreciate it,” Knowles says. 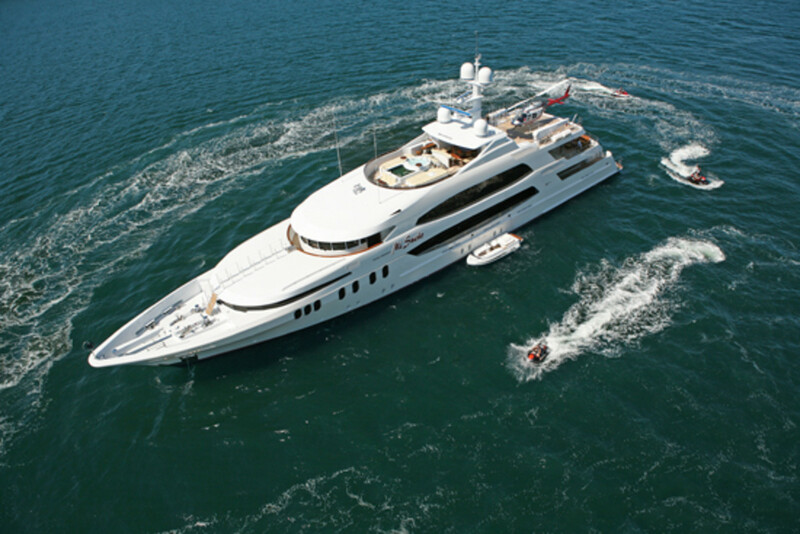 Mi Sueo ranked #43 on PMY&apos;s list "America&apos;s 100 Largest Yachts 2010"